Happy new year! Like I talked about last week, this update resolves some feature disparities in the Text tool between GDI (XP) and DirectWrite (Win7/Vista). It also improves overall performance, as well as the correctness and quality of the Move Selected Pixels tool, the Image->Resize function, and the Hue/Saturation adjustment. Thanks for the update, Rick. When scanning in images from my scanner, which I do a lot, I find that is slower than any other tasks I do. That sometimes takes a couple of minutes. Progress indication on the taskbar would be nice at times. Jeff, I believe you already asked for that, and I do have a bug filed on it. It may not be possible, however, since the scanning UI is handled by an external component (WIA). YES! Thank you! I can install Paint.NET once again. I had to resort to using an old version of Paint.NET on Win7. Any chance you could make the Ribbon an option for future versions of PDN? Herochild, you probably did. As have 800,000,000,000 other people. 1. I would like to be able to have the edges of the canvas in the middle of my screen. Sometimes I’m zoomed in and need to edit some pixels at the edge of the canvas and it’s a pain to move the tool windows every time to do that. Also it’s not optimal to have to work at the edge of your screen (I have PDN maximized). If you zoom in you’ll notice that Paint’s font rendering uses all kinds of colors (like cleartype does) and that PDN’s font rendering only uses greyscale. Can this be fixed? 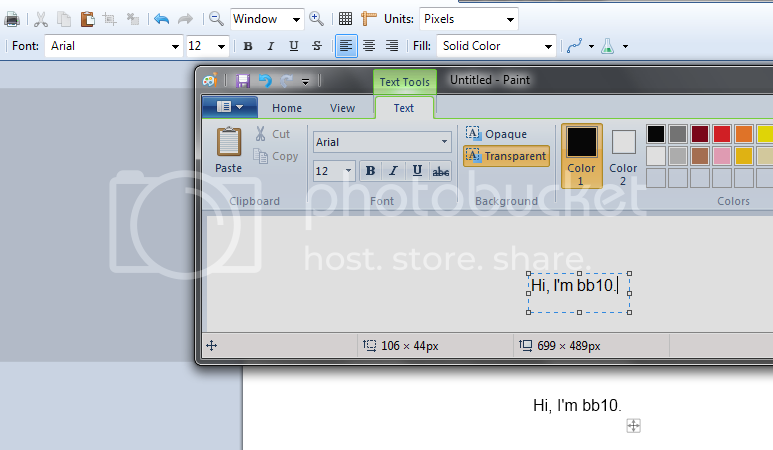 bb10, regarding #2, you are correct in that Paint is using ClearType, whereas Paint.NET is not. Not using ClearType is intentional. You do not want to use ClearType when adding text to images; it is a rendering technology that is only appropriate for UI text. This is not a bug — it will not be “fixed”. not sure if this is a bug or not, but when I copy and paste an image into PDN, it won’t let me edit anything outside of the image. I don’t know if this has been asked for before but any chance of getting a smudge/blur tool? and also i wanted to know is there anyway of making a batch file or script that will run many filters/effect on a file then save the file? I know how to write simple plugins but can’t think of anyway this is possible. One thing I really miss is the ‘Export’ command. Assume I work on the icon saved as ‘pdn’ and I want to save it as ‘png’. Now, I must use ‘Save as’, which leads to layer flattening and leaves the project like that. Then, if I want to go on, I must ‘undo’ flattening and click another ‘Save as’, this time ‘pdn’ again. All this may be avoided with simple ‘export’, like other similar programs do. Thank you for such a useful and amazing tool, it really is great. I look forward to using it for years to come and constantly turn people onto it. Great application and I use it all the time however I would like to second comment #1 from posting “By bb10 on Jan 4, 2010” with regards to having the edge of the canvas in from the edge of the screen while in maximised mode, for the same reasons.